Last weekend and finishing this morning, our fairway fertilizer was spread on our 25 acres of zoysia/bermuda. We still need to walk apply fertilizer to the close approaches, warm season green surrounds and tees early this coming week. We applied 5,900 pounds of material which gives us an effective rate of 3/4# of nitrogen per one thousand square feet. This should be sufficient fertilizer for the season unless I make a 1/4" spray-able application in August of urea. The warm nights and high rain fall early in the week have kicked in the warm season fairways. This fertilizer should also give it a needed boost and help to fill in a majority of the voids. We will continue to remove spots as needed but will be using our sod nursery near the lakes and hole 16 The staff laid 350 yards of zoysia this week which also meant they picked up 350 yards of soil/sod mix and hauled it away. A tough job which required well over 100 hours of labor to complete. We do not make an attempt to kill every weed on property. Our efforts are to concentrate on the main areas of the course, greens, tees, fairways and first cut of rough. Over the last couple of days, I've sprayed a couple of tanks of product to reduce some of the weed populations on our fairways and tees. I spot sprayed a 7 acre tank mix of broadleaf weed killer on our fairways, some tees and rough. I spot sprayed mostly knotweed but did include white clover that is popping up in various areas as well. I also sprayed some of the rough as well. Seeds from these weeds can be spread to other areas of the course so it is important to knock down areas that have higher populations of weeds so that we don't seed clean areas of turf. If you played yesterday or over the next couple of days, you will notice some block patterns of dye on the course covering some sections of fairways and in some cases a complete tee. We are spraying for a weed called Green Kyllinga. Click on the link for more details. We have a number of tees which are covered with this weed. I spot sprayed about 25,000 sq ft of fairways and tees with a product that should knock down the weed but will also require a follow up application. Blue tee #1. Red tee and white tee are covered with this weed. 18 fairway and a spot covered with Kyllinga. It can take over an area if not treated and grows about twice as fast as the turf. Area on 18 fairway that literally looks like we planted the weed. This morning the greens were hydrojected. 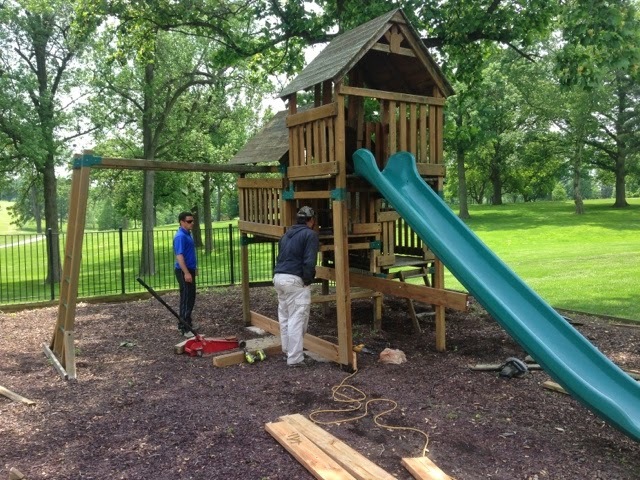 Please check out the video below which describes the work that was completed. Very minimal disruption to ball roll and will continue our work toward having healthy greens all season long. Just started to use our tree root pruner today. Purchased from Commercial Turf in Chillicothe. This unit will be invaluable in our tree management efforts to improve the overall conditions of our turf grass in our main play areas near greens, tees, fairways and rough. This unit will help to conserve water of our tree lined rough and fairways, will improve fertilizer availability for grass and will enhance the rough allowing it to be more consistent throughout the property and overall a much more healthy plant. It will also enhance other other turf surfaces such as fairways, tees and greens. A number of other projects were completed this week. The staff completed support work on the play ground equipment. New support footings were added. 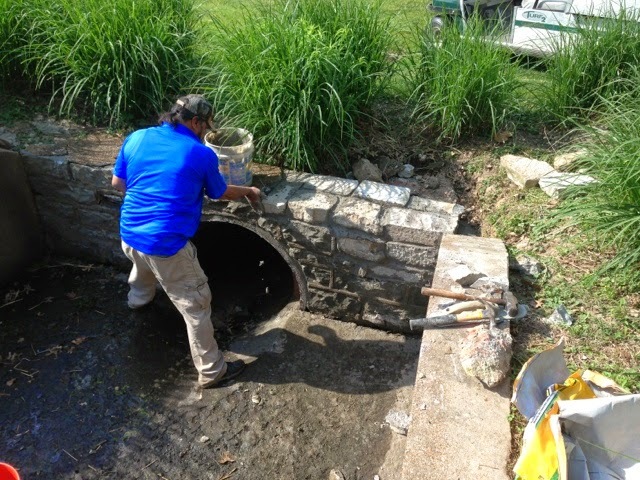 The head wall on the lake spillway was repaired as were some stones that had broken loose on the landscape area of 15. The native area on 12 and 13 were brush hogged. Attempted to do it 2 weeks ago but had to repair the mower. Pulled some plugs on the long range tee, drug them into the weak areas, spread a few loads of sand topdressing and a heavy application of fertilizer to push some growth. Extra water applications are being made to keep area moist and help the push the new plugs. Try to open tee very soon is all I can say. Forgot to take pictures but added 15 grass carp to the 2 small lakes on 10 to assist with grass plant removal. This reduces the need for chemical applications since this water feeds into our irrigation lake. 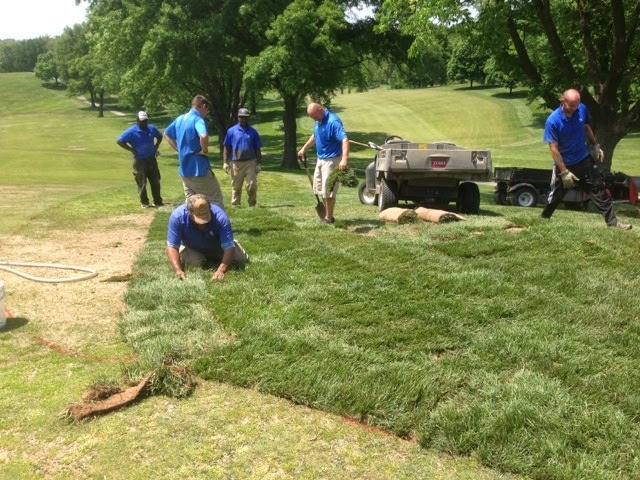 The past few days, the staff laid over 600 yards of sod in various places. 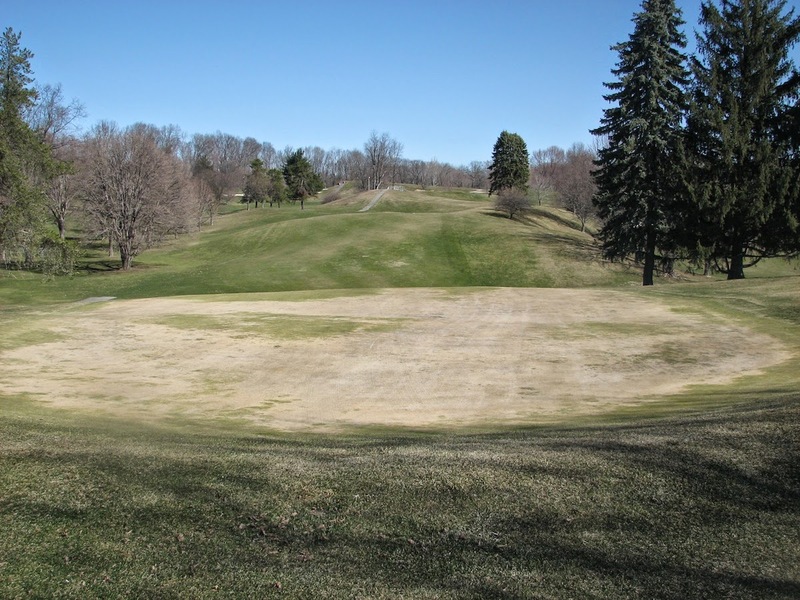 Zoysia was placed in zoysia/Bermuda areas that was very weak and slow to recover from winter. Large spots on 3, 1 approach, 3 green and 10 were replaced. Fertilization has been completed on holes 1-2, 5, 17-18 Saturday which will begin to push growth. The remaining fairways will be completed early this coming week if the Large patch on zoysia has slowed in its growth. With the warm rain we just experienced this morning and near 90 degrees predicted over the next couple of days, I would expect the majority of our warm season turf to fill in before Member/Guest June 12th. Other areas included fescue turf around the 3rd green, behind the bunkers on 5 and remaining stump areas. Staff removing some zoysia in the intermediate along 3 green. Area was thin and week. Replaced with cool season. Extended from bunkers to green edge. Will look much better. Staff adding fescue to the left side intermediate. Opposite side of green. 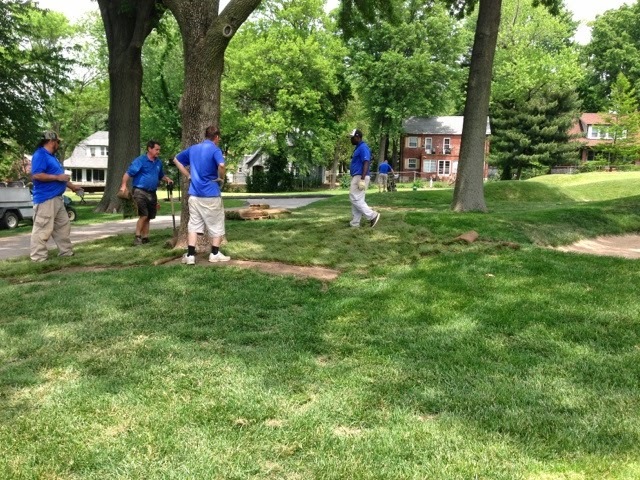 Removing damaged sod under the trees behind the bunkers on #5. Severe shade, drought stress from trees out competing turf for moisture and wear from equipment were all contributing factors. 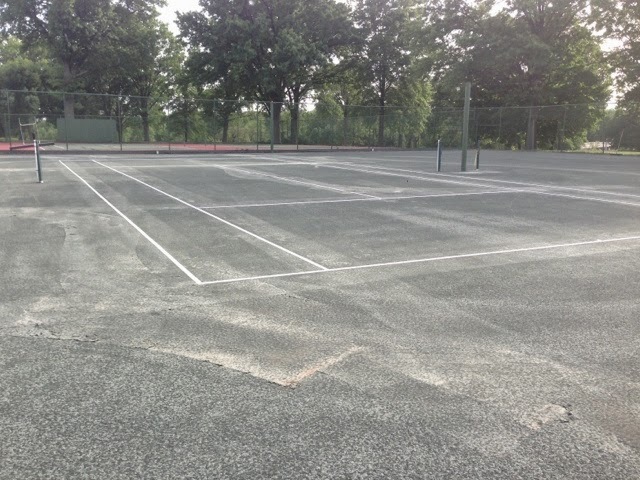 Tennis court 1 is now open for play. Plan to have court 2 open by mid-week. Over this holiday weekend, please take a moment to remember those who paid the ultimate price for our country and the freedoms we are given. Staff member Nick's brother lost his life in the Vietnam War well over 40 years ago. On Monday, we took the opportunity to give the greens a light verticutting/grooming a few weeks before the member guest. We topdressed the greens, brushed them with our cocoa mat and mowed them. This should help improve ball roll and smoothness. We will probably topdress again next week about 10 days out from the Invitational to insure the greens are at their best for our upcoming event. Jeff using a standard riding greens mower but with vertical mowers on the unit. Why its called vertical mowing, blades are 3/4" apart and are up and down. Becky ordered in some larger hanging baskets for the pool area this season. There are seven of them and they hold Dragon Wing pink and red begonias. Should look really nice and the concrete planters have been growing as well for about two weeks. Begonias ready to be hung up on the pergola. The pergola with seven new hanging baskets. Right after planting from the greenhouse. Details on the flower types at another time since I'm home and can't remember the varieties that Becky planted. Last week, the staff spread the chipped mulch in the 9 woodland garden area. We had placed it there a couple of weeks before, expecting some potentially heavy rain days but did not receive the expected rains, at least when the staff was on the clock. This product was chipped from all oak trees that were either pruned or removed this past year. It is a free product and saves us a significant amount of money each season. It has good color and will hold it color long into the season since it is all oak. View from the road with the Dawn Redwood 'Raven' in front. A little closer view toward 9 green. If you've been out to play the course in the last week, you might have noticed some stained posts along the cart trail of #4. In years past, we've had some small green stakes with 3/8" green rope which served its purpose in restricting traffic from driving straight from 4 tee cart path to the fairway but looked rather hideous. Over the winter, the staff prepared the posts that are now out on #4. We've purchased some 1/2" thick nylon rope which will direct traffic to go down the cart path and up the hill before entering the fairway. We have placed inserts in the ground that will allow us to remove the stakes during the winter season and during trimming. We have made the two end section ropes removable so we can spread the wear and tear from cart traffic. We will have walker access points in their appropriate place. We have stakes set up for #8 as well to push cart traffic around the corner before entering the fairway. I hope we can get this work completed before the holiday weekend. A big tip of the day, on every hole carts should enter from the side of the fairway and not the beginning of the fairway. Looking back toward 4 red tee from top of hill on #4. The two end ropes can be removed as needed to spread wear and tear from traffic. Made a video discussing the rough bermuda spray that was applied on April 26th. Holes 1-3, 13, 15-18. Video gives most of the details below. 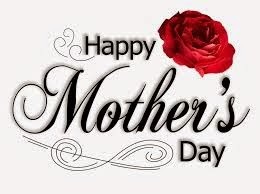 Happy Mother's Day to all the ladies out there taking care of the boys and girls in their lives. We could not make it without your love, care and concern. A special thanks to my mom and the care she has given me over the years, of course that care has not stopped since I've left home! Still has to shoosh me from time to time when I'm out in public and begin to get a little carried away. Also to my wife Elizabeth for her strength to stand in front of the train from time to time that is Joe. Sometimes exhaustion mixed with pure stupidity makes it difficult for my partner in life. She recently lost a life long friend and has been taking care of her mother at our home in what will be the final stages of independent living is very difficult. In the end as many have faced, she's been pretty much the support person for her mom for many years now, Dr. visits, administrative duties and anything else that has been needed. Sometimes I won't be seen at the club late in the day as I have been in the past in an effort to help her with our current family situation. Its the least I can do for the long leash of support she has given me over the years. Mom-in-law Fleta who at 97 years young shows great courage under some difficult circumstances that the age above can bring. Put a few scratch offs in front of her and Family Feud reruns and you will barely get a look once she's in her wheelhouse concentrating on those numbers. The plant sale will be held on Saturday, May 10th from 9-11 a.m. at the maintenance building. The greenhouse will be open but for viewing only. All plant material for sale will be in the maintenance building set up on tables. When I first started the sale in 2009, I handled the ordering and installing all plant material. I figured many like to buy plants for their homes and I would have some extras available. Why not share them with the members and the funds raised would offset the cost of growing the plants in the first place. A win/win for everyone. I ordered simpler varieties and a majority of the plants were grown in 6 pack flats and we would growing 6000 plants. Would usually have an abundance of plants in some varieties. My bed planning was to buy the plants I liked and figure out a way to make them work. Sometimes it worked, sometimes it did not. Becky who now handles our horticulture program is just in the beginning stages of planting. She now brings in a lot less plants per variety grown. Most are grown in 4" pots but with many more varieties. I believe 62 varieties totaling nearly 4000 plants this year. As a horticulture professional, she has planned her combinations, estimated the number of plants she needs and then orders in the material in January. As most home gardeners know, you might estimate and end up falling short or have too many plants. Some of the plants we ordered in to grow are not necessarily available from garden shops. That is the dilemma she faces with making plants available for sale, especially since we are in the early stages of planting. She spoke with me this morning regarding what she can make available and it sounds like a wide range of plants. We will a number of items available for sale but will probably not have large quantities of any one item. A number of unique species for containers or small plantings. Accounts will be billed in the usual manner. See you Saturday! A member passed this article on to me from the Chicago Tribune on difficulties with golf course conditions in the Chicago area. Parts of Michigan and Toronto were also hard hit areas. Thoughts are with all the guys and ladies trying to deal with getting their courses back into shape. The importance of reducing the amount of poa annua on greens as much as possible. Think you had a tough winter? Pity the area's golf course superintendents. For weeks they've desperately tried to turn their bumpy browns into smooth greens. A blog written by Skokie Country Club superintendent Donald Cross warned that viewing pictures of the course's weather-damaged greens "can lead to Insomnia, Hypertension, Depression, Anxiety, Irritability, Stress, Mood Swings, and other psychological and physiological conditions ... all of which have been experienced by this author!" Dr. Ed Nangle, director of turfgrass programs for the Chicago District Golf Association, said he has seen fairways that look like "a chameleon in a candy shop." Gary Groh, the head professional at Bob O'Link in Highland Park, summed up his frustration over the chilly spring this way: "It's 48 degrees here right now up by the lake. Doggone it!" The driving range is open at Bob O'Link, but the course might not be playable until June after the poa annua died on about 13 greens, forcing the club to re-plant. And Bob O'Link is in the majority. Public or private, small or big maintenance budget, few courses were immune to the big chill. A survey conducted by the CDGA and Midwest Association of Golf Course Superintendents found nearly 65 percent of area courses have damaged greens and an estimated 85 percent have issues with fairways or tee boxes. "I've been in the business for 25 years," MAGCS executive director Luke Cella said. "This is the worst." Cog Hill owner Frank Jemsek can't remember worse weather-related conditions in his 50 years in the business, according to daughter Katherine, the club president. The greens on Cog Hill's signature "Dubsdread" course are fine, but some greens on the Nos. 1-3 courses have puncture marks as a result of aeration. "Customers are noticing and asking a lot of questions," Katherine Jemsek said. "We try to educate them and explain that we're doing everything we can." With ground temperatures stuck in the 40s, too cold for grass to grow, courses have had to create their own "temps" in the form of temporary greens. Skokie opened the season with just three of its normal greens and is now up to eight. Officials at Wynstone Golf Club in North Barrington created temporary greens at the end of fairways. Landing an approach shot inside a spray-painted 20-foot circle encompassing the hole yields an automatic two-putt. Get your ball within a 4-foot circle, and you can walk off with an unsatisfying one-putt. Wynstone's goal is to have every regular green playable by Memorial Day weekend. In August the club will shut down for a "gassing and regrassing" of all 18 greens, a $150,000 project that will replace the temperamental poa annua with weather-resistant bentgrass. That divide was evident at Medinah, where the poa annua greens on the No. 2 course "were slow to wake up," superintendent Curtis Tyrrell said, but the bentgrass greens on the world-class No. 3 course were barely affected. Clubs are reluctant to make the switch, though, because it requires about 16 weeks of growing weather. So on top of being shut down in the fall, Wynstone might not be ready for play in 2015 until June. "Change causes heartburn at private clubs," Wynstone head pro Andy Phelan said. "This is a third home for our members, after home and the office." It's a sensitive enough topic that officials at intensely private old-money clubs Shoreacres and Old Elm declined to comment. Dan Dinelli, a third-generation superintendent, said members at North Shore Country Club in Glenview have been largely sympathetic. Dinelli's maintenance crew limited damage by using plant protectants to winterize and by removing snow and breaking up ice in February. The club has just two temporary greens and expects to be in top shape for the Encompass Championship, the Champions Tour event the club will host June 20-22. "Honestly I'm really just focused on member use now," he said. "It has been a long winter for everyone." Cella, who works with superintendents throughout the Midwest, said the winter culprit was "ice encasement." "People think the turf goes dormant in the winter," he said, "but the grass still needs oxygen to live. When it gets encased in ice, there's a buildup of toxic gases and it dies." A chilly April made a bad situation worse. "When the Masters is on TV, I've usually mowed five to seven times," Cella said. "I mowed my lawn for the first time last weekend. We're a solid three to four weeks behind, so you can't even get grass seeds to germinate." Cella and the CDGA's Nangle have been advising superintendents — and trying to help them keep their sanity. "There's no point in panicking," Nangle said. "But there's frustration and impatience because the temperatures now are what they should be in late March." Nangle said whatever the superintendents did in the winter and spring, "it didn't seem to matter. The guys who covered (the greens) did not get perfect results. And some that didn't cover on heavily tree-lined courses did fine." One of those is Glencoe Golf Club, a public course charging $50 to walk 18 holes this weekend. Head pro Matt Radde said he has heard "horror stories" from pros at other clubs, but he cannot share in the misery. Glencoe has been open since late March, and every green is playable. "Some of the spots aren't pretty," Radde said, "but there's nothing wrong with them. We get a lot of private (club) players who say we have some of the best greens around." Editors note: Sorry for the misspelled words and phrases. Did this on the fly this morning early with low light.) As mentioned in a previous blog, the long range tee while on the grass will be open to Drivers Only on tees. In an effort to provide as normal experience as possible, I am opening the long range grass tee but limitiing to driver tee shots until the Bermuda can improve in its coverage. The short range can handle maximum 150 yard iron shots for your iron practicing. When the tees are on the mats which it will be during wet conditions, all clubs can be used. Most of us like to hit a few drivers before their round or might need to work on hitting it straight like yours truly so this gives you on the ground experience which as we know is different then using the mats. We apologize for this inconvenience but Mother Nature has won the battle so far with our long range tee Bermuda but we will be victorious in the end. Promised some finished pictures of the concrete pour on 15 bridge and the asphalt work on the Marvin Pierson Lane bridge repair. A Turkey and mulching round out the pictures below. Place some heavy duty fabric in the hole to keep gravel in place. Covered larger gravel with smaller which Jason is packing with our vibratory plate. A quick fix so we used bagged asphalt for this repair. Pretty difficult to close bridge down for any length of time since we have many guests using the lane and trying to coordinate with too many people. Jason packing the asphalt after it has been laid out. Finished product. Will seal it in the next few weeks. Tore it out Monday morning and completed before 11 a.m. Tuesday. Quick job. Still have to evaluate clay tiles under bridge for potential lining. The concrete bridge covering on 15 completed. Looks like we have a Jake Turkey playing around over on holes 2-3 again like a couple of years ago. Becky mulching the main entrance beds at the clubhouse. 75 yards of mulch to spread and she is doing most of it herself. Watches over her plants like a hawk! Staff has assisted but its mostly her work one cart load at a time. The staff will do the large area down in the woodland garden on 9 with the chipped mulch for her. Not too many plants to get in the way down there. Finished product. Looks great. Fine layer, just enough to change color. We don't like big piles of mulch in our beds. Helps to hold moisture in soil but not create an artificial layer for roots to live within. Living room bed becoming my favorite. Lilac trees beginning to pop out. Smell will be awesome in a few days. 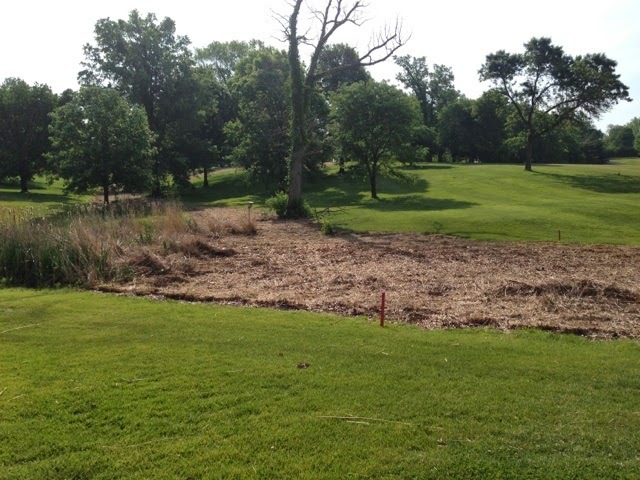 Making progress in turf growth on the long range tee but its slow progress. 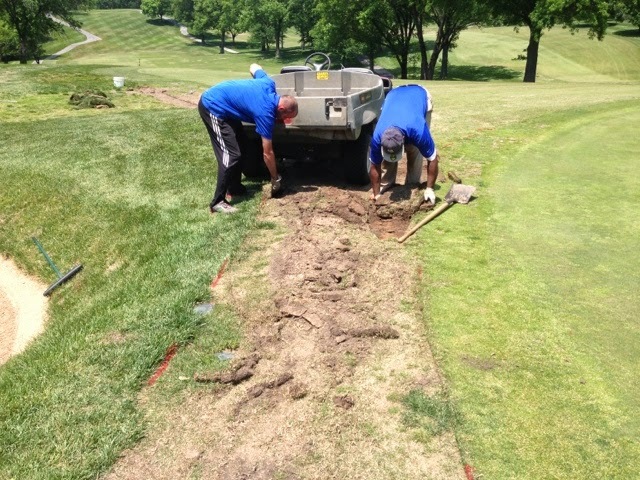 Other clubs in town with bermuda range tees are having the same struggles. Posted a video with all the details below regarding the long range tee.